Assistant Commissioner John Yates: "No further investigation is required"
Police say there will be no further investigation of claims that a huge mobile phone-hacking operation was launched by the News of the World. The Guardian alleged the tabloid's reporters paid private investigators to hack into thousands of phones, many owned by politicians and celebrities. But the Metropolitan Police said no new evidence had emerged since an original inquiry saw two men jailed in 2007. The CPS said it would carry out a review of the evidence presented to it. Director of Public Prosecutions Keir Starmer QC said: "I have no reason to consider that there was anything inappropriate in the prosecutions that were undertaken in this case. "In the light of the fresh allegations that have been made, some preliminary enquiries have been undertaken and I have now ordered an urgent examination of the material that was supplied to the CPS by the police three years ago. "I am taking this action to satisfy myself and assure the public that the appropriate actions were taken in relation to that material. The original phone hacking investigation resulted in News of the World royal editor Clive Goodman and private investigator Glen Mulcaire being jailed for four and six months respectively in January 2007. Today Yates of the Yard decided that he did not want another starring role on the national political stage. His insistence that there was no evidence that John Prescott's phone was tapped, insufficient evidence to bring other prosecutions and that no new evidence had been produced by the Guardian, sounded pretty definitive but these waters are still treacherous. There will still be a Commons enquiry and there will be calls for an independent investigation into the police's handling of this affair. There will still be awkward questions for News International, for the Tories' director of communications Andy Coulson and for the man who hired him David Cameron. 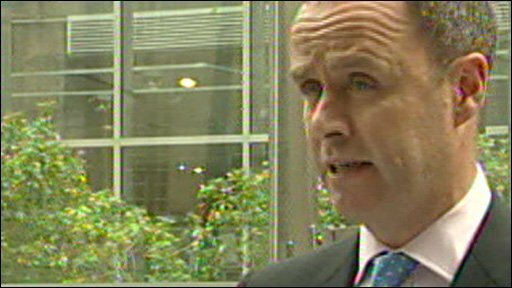 Met Assistant Commissioner John Yates said Goodman and Mulcaire had been engaged in a "sophisticated and wide-ranging conspiracy to gather private and personal data, principally about high profile figures". He added that inquiry had been the "subject of the most careful investigation by very experienced detectives". He said: "No additional evidence has come to light since this case has concluded. I therefore consider that no further investigation is required." Mr Yates added: "There has been a lot of media comment today about the then deputy prime minister John Prescott. "This investigation has not uncovered any evidence to suggest that John Prescott's phone had been tapped." But Mr Prescott told the BBC's Newsnight programme that there were still "serious questions to be answered". "Frankly he has come out, he has defined in a very narrow way what he is going to look at, and then gives a report that everything is OK," he said. The Guardian claimed Mr Prescott, London Mayor Boris Johnson, former Culture Secretary Tessa Jowell, actress Gwyneth Paltrow, model Elle Macpherson and publicist Max Clifford were among "two or three thousand" public figures targeted by the hacking operation. The details obtained by the Guardian allegedly emerged during a court case last year involving Professional Footballers' Association chief executive Gordon Taylor and the News of the World. Mr Taylor sued News Group, which owns the News of the World, on the basis that its senior executives must have known about an alleged hacking operation on his mobile phone - claims of which had emerged in the court case involving Goodman. He received £700,000 in damages and court costs last year, but on condition that details of the case were not made public. Earlier the House of Commons culture and media select committee announced it was reopening an inquiry it held after Clive Goodman was jailed. Its chairman John Whittingdale said former News of the World editor Andy Coulson, who now works as director of communications for the Conservative party, was likely to be summoned to give evidence. Mr Coulson said: "This story relates to an alleged payment made after I left the News of the World two-and-a-half-years ago. I have no knowledge whatsoever of any settlement with Gordon Taylor." He has previously said he was unaware of any widespread hacking operation when he was editor of the paper. News International, the parent company of News Group, said it would be "inappropriate" to comment on the Guardian's allegations.